This team’s goal? Better financial planning skills for all Canadians. Let’s count our blessings as Canadians. How many other countries right now have a determined national goal to help improve the economic standing of all citizens through financial education, otherwise known as financial literacy? How many other countries have made seniors their first order of priority for improved skills in financial planning and personal money management? The answer to these questions is that Canada stands a breed apart. Indeed, I’ve got to say bravo Canada. All of us at my agency Credit Canada Debt Solutions are beaming with optimism following a very special event we participated in just days ago in Toronto. 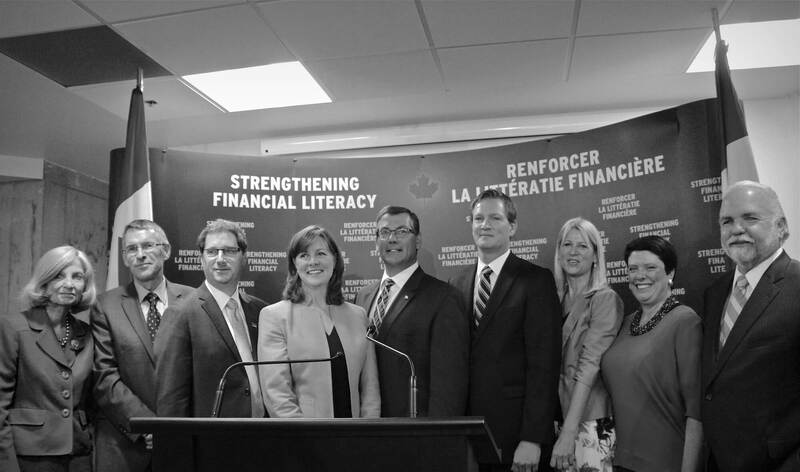 At that time, Canada’s Minister of State (Finance) Kevin Sorenson – along with Canada’s first Financial Literacy Leader Jane Rooney – announced all those participating in a newly formed National Steering Committee on Financial Literacy. I’m honoured to be one of those members among a talented and diverse group of 14 other committed leaders and professionals in the financial sphere. Canada now has a stellar brain trust to move forward with the all-important task of making Canadians smarter about they way they handle their money. The steering committee has plenty of work ahead. As we get down to the immediate task of exploring the financial literacy needs of seniors – with a report due this fall – we’re also looking ahead to 2015 to unveil a broad game plan with prospects for helping all Canadians improve their financial planning skills. That seniors are first on the list should surprise no one. Any healthy society honours its elders and looks out for them. Like most Canadians today, those in their golden years can use help unearthing treasures of wisdom about personal finance. We know from experience at Credit Canada that for many retirees and those approaching retirement, more knowledge is needed regarding personal financial planning, budgeting, and smart spending. Also, and especially in this technological age, our seniors are frequently beset by fraudsters. Older Canadians are facing economic hurdles. Financial hardship among them is growing. Lacking financial planning skills, many are struggling, relying only on government pensions that are not enough to live on. At the same time, older Canadians face job insecurity, interrupted work, and of course health issues. These and other factors, combined with unprecedented levels of personal debt at all levels within the country, call for financial literacy tools and programs that can help seniors get on with life in comfort and security. Through the remainder of 2014, the National Steering Committee on Financial Literacy is laying the groundwork to make these tools and programs a reality. The team’s formation is the result of a lot of work in financial literacy that’s already been undertaken by the federal government working in league with public, private, and non-profit organizations across Canada. Representing my not-for-profit agency Credit Canada, I was pleased to earlier serve with a number of others as a member of the Federal Task Force on Financial Literacy, which recommended the formation of the National Steering Committee. As we say to all the debt-laden people who come to Credit Canada for help through credit counselling and sound financial planning, how wonderful it feels to see one’s goals at last become reality.